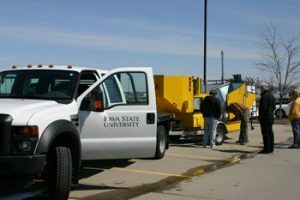 The Center for Earthworks Engineering Research (CEER) KUAB Model 150 2m falling weight deflectometer (FWD) enables researchers to perform non-destructive, quick, and dynamic evaluations of paved surfaces, aggregate sub-bases, and soil subgrades without leaving the testing vehicle. The FWD simulates a moving vehicle’s wheel load by using a falling-weight loading system to create a temporary deflection basin on the tested surface. Deflection is a dynamic rather than static measure, in that deflection describes the surface’s response to a change-like traffic loading-rather than a material property-like solid compression. 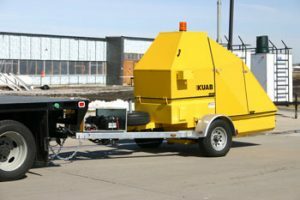 Surface deflection measurements are the paving industry’s most common dynamic means of performing structural analysis, evaluating service life, and identifying areas in need of repair. CEER’s FWD is mounted on a trailer and equipped with a loading system, seven seismometers, a data integration system, and a control system. In addition, the FWD is designed to fit into a compartment on CEER’s mobile research facility during storage and long-distance travel. The 3,500 lb (1,600 kg) trailer rests on two wheels while traveling between the testing sites. 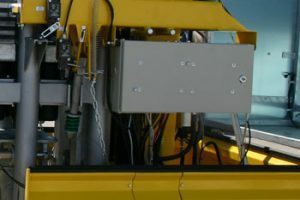 Bay doors on the underside of the trailer remain closed during travel and open automatically during deflection testing. 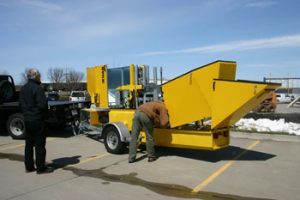 A protective metal shell covers the equipment on the trailer during normal use, but the shell can be opened and closed manually to access the equipment for calibration and repair. The shell has been altered from the standard KUAB design to allow the FWD to fit inside the T3 storage compartment. A power system for the testing equipment is mounted to the front of the trailer and receives power from the truck. Near the middle of the trailer, the FWD’s loading system can produce different loads for various testing needs, from 3,000 lbs-force (a small car) to 33,000 lbs-force (a small aircraft during landing). The KUAB FWD uses a unique double-mass loading system to create a deflection. In a single-mass system, a mass is dropped onto a single buffer connected to a load plate, which rests on the surface being tested. The load force is transferred through the plate, and the plate creates a deflection that simulates a wheel load. In contrast, the KUAB double-mass system drops a first mass onto a double-buffer system, which includes a first buffer, a second mass, and a second buffer. The double-mass system essentially produces a longer loading duration that more precisely represents a wheel load. To produce different load forces, the initial falling mass can be increased or decreased, and the height of the drop can be altered. The load plate that transmits the load from the double-mass system to the surface is divided into four segments. 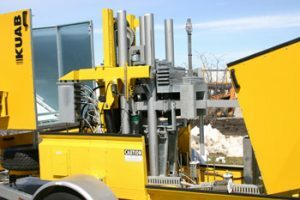 This configuration ensures that the load is evenly distributed across the area of the plate, an especially useful feature when testing irregular surfaces like aggregate sub-bases. A piston is attached to each segment, and each of the four pistons is linked to the same fluid chamber. When a load hits the surface, each piston pushes up individually, and the common fluid chamber ensures that the cumulative load across all segments remains constant. The loading system can be fitted with a 300 or 450 mm plate, depending on the force per square inch needed for the test. To ensure that most of the deflection emanates from the plate rather than the trailer, two legs on the underside of the loading system support the trailer’s weight and minimize the contact area between the trailer and the ground. Seven seismometers contact the surface during testing and measure the deflection from the plate. One sensor is placed over the load, while the other six are situated behind and in front of the load to measure displacement at different distances from the plate. 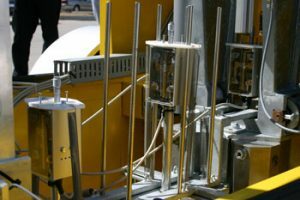 Each seismometer includes a linear variable displacement transducer (LVDT) that converts the deflection readings into voltage data that are sent to the data integration system. Each seismometer also includes a micrometer for annual calibrations. Compared to other types of FWD sensors, seismometers provide more direct deflection readings and have a larger measurement range. The seismometers can thus measure both the large deflections of soils and aggregate and the smaller deflections of pavements. The data integration system near the front of the trailer, including signal coordinating and processing components, converts the analog voltage readings from the LVDTs into integrated digital deflection data. The processed data are then sent via an Ethernet cable to the laptop computer in the truck cab. A laptop computer in the truck cab controls the testing process using software provided by KUAB. With the software, the operator can program the amount of load force, the number of drops, plate size, and other testing variables, while a video display shows the plate’s location on the surface and a distance meter indicates the distance of the FWD from the previous testing point. The operator programs the appropriate testing variables into the laptop’s controller software, such as load force or other variables that change under different site conditions. The truck positions the FWD trailer over the surface to be tested. The operator initiates the testing process using the laptop computer in the truck cab. The bay doors underneath the trailer slide open, and the sensors and load plate descend. The apparatus reaches the surface and lifts the trailer off its wheels, the loading system’s support legs carrying the bulk of the trailer’s weight. The first mass on the loading system lifts up and then falls onto the double-buffer system. The force of the falling mass is transferred through the plate to the surface, creating a deflection basin. The seismometers read the resulting deflection in the surface, and the LVDTs convert these readings to voltage. The voltage readings are sent to the data integration system, where they are converted into digital signals and sent to the laptop in the truck cab for display, analysis, and storage.